Ayoko na is Sarah Joyce Ocampo’s original composition. This song was recorded using a cheap computer microphone. The audio editing software used was GoldWave. 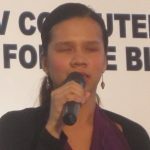 Sarah Joyce is a blind singer from the Philippines and was featured here several times. Why not, she’s very talented. I really like her voice actually. But she’s not just a blind singer, she also knows how to play guitar, piano, flute and other musical instruments. I invite you to have a listen to her song above and tell me in the comment if you think I am correct about her being a good singer or you think there are still things that should be improved. Advice is much welcome and expect that I will relay to Sarah Joyce whatever suggestion or objective criticism you may have for her.